Report on the 4th Annual Taste of Mendocino, presented by the Mendocino Winegrape & Wine Commission and Visit Mendocino County on Monday, June 11th, 2012, at Terra Gallery in San Francisco, California. 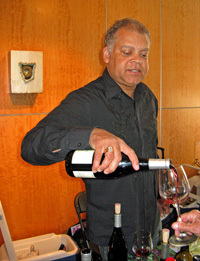 The event features an extensive tasting of wines sourced from vineyards throughout Mendocino County. Taste of Mendocino is more than just a wine tasting event – it’s described on their website as a “united showcase of all things Mendo,” featuring “the best in wine, food, travel, lodging, nature, activities, adventure and more.” The event was hosted in its first two years by the Mendocino Winegrape & Wine Commission (MWWC), while this year’s tasting marked the second year as a joint presentation of the MWWC and Visit Mendocino County. The Mendocino Winegrape & Wine Commission counts nearly 100 wineries and over 270 growers among its members. The organization’s mission is “to promote and market the winegrapes and wines of Mendocino” and it “sponsors education and research supporting sustainable viticultural techniques.” Visit Mendocino County is the official travel and tourism organization of Mendocino County, offering information to visitors and working with county businesses to help promote awareness of the area’s attractions and support for tourism. Mendocino County promotes itself as “America’s Greenest Wine Region.” The county features the nation’s first organic winery (Frey Vineyards), first solar-powered winery (McDowell Valley Vineyards), first carbon-neutral winery (Parducci), and the nation’s largest certified organic grape grower (Fetzer) and largest producer of organic wine (Bonterra). 28% of Mendocino’s winegrapes are grown in certified organic or biodynamic vineyards – the largest percentage of any region in the country. The county’s wine history goes back to the 1850s, when the first vineyards were planted, and the first Mendocino County winery was established in 1879. There are currently over 17,000 acres of vineyards in the county. This was my first time at the Taste of Mendocino event. This was also the event’s first year at Terra Gallery, having been held at Fort Mason and the San Francisco Presidio in previous years. It was held during the afternoon and early evening, with the afternoon portion open to trade and media and the evening portion open to the general public as well. Participants at the event included not only wineries, but brewers, distillers, food purveyors and growers, artisans, visitor agencies, area lodgings, restaurants, and other Mendocino County attractions and businesses. Unfortunately, the future of Taste of Mendocino is in doubt at this point, as it was announced just a few days prior to this year’s event that the Mendocino Winegrape & Wine Commission will not be continuing for another five-year term and will be winding down its operations soon. The great diversity of the region may have been a key factor in the county’s wineries and growers deciding not to continue with the MWWC. There are 10 AVAs located in Mendocino County, and it’s been thought that vintners and growers in these various regions don’t always share the same goals. While there are some AVA-based organizations, such as the Anderson Valley Winegrowers Association, the MWWC was the only county-wide organization, so it remains to be seen how Mendocino’s many growers and wineries will promote themselves in the future. The event space at Terra Gallery was a nice size for the Taste of Mendocino. Broken up into several connected spaces, it felt intimate yet not overly crowded, despite an attendance of about 500 people. The only downside to the many spaces – at least for me – was that a number of tables were located in an upstairs room, and since I didn’t venture up there until late during the day, I only made it to a few of those wineries. But aside from that, the event was very well organized and I enjoyed it a lot. Being able to taste wines from all over the county was a great way to experience the diversity of the wine regions all during a single afternoon. The food at the event was very good, and it was nice to be able to take one or two quick breaks to enjoy some of the tasty treats. I ended up spending part of the afternoon behind the Harrington Wines table – I work there part-time and I was able to give Bryan Harrington a chance to get out to do a little tasting. I poured four Harrington Pinot Noirs from Mendocino County, including a couple from Wiley Vineyard in Anderson Valley and another one with no added sulfites. It was no surprise that I saw almost no wines from the 2008 vintage being poured at this event. The summer wildfires that year led to smoke-tainted wines for many in Mendocino. Unfortunately, much of that wine could not be released on its own due to the smoke taint issues, and large quantities of Mendocino wine were sold off as bulk that year. But happily, it does not seem like there was any lasting damage to the grapevines, and the wines I tasted from the 2009 and 2010 vintages were generally quite nice. One of the strengths of the Taste of Mendocino event was being able to sample many wines from the inland parts of the county, as this area does not tend to be as well-represented in broader tasting events as Anderson Valley is. I tried to visit winery tables from various parts of Mendocino County, and after all was said and done, I stopped at just about half Anderson Valley producers and half from other parts of the county. Looking through the list of favorite wines from the tasting, I found that it reflected the diversity of both grape varieties and wine regions that Mendocino County has to offer. Favorites represented growing areas ranging from both the cooler and warmer ends of Anderson Valley, Redwood Valley, Ukiah Valley, the remote Comptche area, and the mountainous regions of Mendocino Ridge, Yorkville Highlands, and Cole Ranch. I decided to include no more than one red and one white per winery on the favorites list, although there were several producers that could well have had additional wines listed – Donkey and Goat, Drew, Harmonique, and Londer were among these. 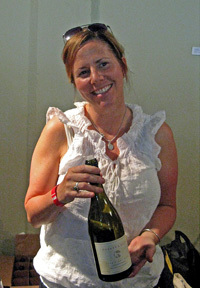 Those wineries, along with Elke, presented the strongest overall wine line-ups that I tasted at the event. Demuth Kemos and Foursight were two producers that were new to me and which impressed me quite a bit. Overall, there were a lot of very good wines poured at the event, and it served as a fine showcase for Mendocino County. I do hope that Taste of Mendocino finds a way to continue in the future. Girasole 2010 Pinot Blanc, Mendocino County. Very light color, this had leesy pear and stone fruit aromas. Creamy texture, with a fairly smooth finish. Barra 2011 Pinot Noir Rosé, Estate, Mendocino County. Very light pink color, with aromas of strawberry and fresh herbs. Lighter-bodied with a relatively smooth mouthfeel and finish. Girasole 2010 Pinot Noir, Mendocino County. Medium-light garnet color, displaying earthy black cherry, spice, and mineral notes plus a touch of vanilla/oak. Medium-bodied with a lively mouthfeel and mild tannins on the finish. Barra 2006 Sangiovese, Estate, Mendocino County. Medium red-purple color, this had earthy cherry and raspberry fruit along with dried herbs, baking spices, and a dash of smoky oak. Medium weight on the palate with lively acidity and big but not aggressive tannins, nice. Comments: All of the fruit for these wines comes from the certified organic estate vineyard in Redwood Valley, first planted by Charlie Barra in the 1950s. Bink 2011 “Lumineux,” Hawk’s Butte Vineyard, Yorkville Highlands. Rosé of Merlot, on skins for 48+ hours, made entirely in stainless steel. Medium-light pink color, with fresh red fruits, spice, and a bit of black pepper on the nose. Medium-light bodied with nice acidity, and just a touch of tannic bite on the finish, nice. Bink 2007 Pinot Noir, Weir Vineyard, Yorkville Highlands. From DRC, Pommard, and 2A clones, about 30% new oak. Medium color, with intense black cherry and plum, herb, and earth aromas, plus a touch of sweet oak. Big and structured, this finished with moderately grippy tannins. Bink 2006 Syrah, Hawk’s Butte Vineyard, Yorkville Highlands. 25% whole-cluster fermentation, about 30% new oak. Medium-dark color, featuring blackberry, iron/minerals, black pepper, and earth, along with a floral note. Big but very lively on the palate, with a firmly tannic finish – very nice Syrah that deserves more bottle age. Bink 2007 “Melange,” Yorkville Highlands. Bordeaux-style blend from Old Chatham Ranch Cabernet Sauvignon and estate (Hawk’s Butte) Merlot and Syrah, aged in about 30% new oak. Medium-dark color with bright aromas of plum, blueberry, and dried herbs, with undertones of vanilla/oak. Rich mouthfeel with good structure and chewy tannins on the finish. Comments: Much of the fruit for the Bink wines comes from their estate Hawk’s Butte Vineyard in the Yorkville Highlands, in the mountains southeast of Anderson Valley. Chiarito 2009 Zinfandel, Estate, Mendocino County. Medium color, a less fruit-forward style that showed earth, minerals, and pepper along with wild berry fruit. Medium weight on the palate with bright acidity and a fairly tannic finish. Chiarito 2009 Negroamaro, Fox Hill Vineyard, Mendocino County. Medium color, featuring peppery plum and black cherry fruit along with spice notes. Medium-bodied with plenty of acidity, this finished with moderate tannins, an intriguing and distinctive wine. 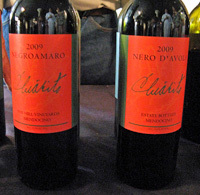 Chiarito 2009 Nero d’Avola, Estate, Mendocino County. Medium-dark color, with a darker fruit profile, plus dried herbs and earth on the nose. Bigger mouthfeel with lively acidity and grippier tannins. Chiarito 2009 Petite Sirah, Estate, Mendocino County. Dark color, this displayed riper dark fruits, chocolate, pepper, and earth aromas. Big, rich, and tannic, this will take some bottle age to mellow a bit. Comments: Chiarito featured wine from two grape varieties that are not widely-planted in California – Negroamaro and Nero d’Avola. The estate vineyard is on the Talmage Bench, above the Russian River just southeast of Ukiah. Claudia Springs 2010 Viognier, Lolonis Vineyard, Redwood Valley. Light color, with stone fruit and tropical fruit aromas and a slight floral note. Fairly rich but not heavy, with a smooth finish. Claudia Springs 2010 Carignane, Vittorio Vineyard, Redwood Valley. Medium color, this showed peppery black cherry and darker fruits, earth, and dried herbs. Medium-light bodied, with milder tannins on the finish. Claudia Springs 2010 Grenache, Rhodes Vineyard, Redwood Valley. Medium-light color, featuring strawberry, spice, and an herbal note. Medium weight in the mouth with moderate tannins. Claudia Springs 2010 Zinfandel, Redwood Valley. Medium color, ripe, brambly red and black berry fruit, black pepper, and spice. Medium-bodied with good structure and noticeable but refined tannins on the finish. Very nice example of Redwood Valley Zin. Claudia Springs 2009 Petite Sirah, Vittorio Vineyard, Redwood Valley. Medium-dark color, this displayed lots of black pepper along with dark berry fruit and a touch of chocolate. Medium-full bodied and lively, with a grippy tannic finish. Comments: Although Bob & Claudia Klindt’s winery and estate vineyard is located in the “Deep End” of Anderson Valley near Navarro, many of the Claudia Springs wines come from grapes grown in warmer Redwood Valley. Demuth Kemos 2010 Chardonnay, Demuth Vineyard, Anderson Valley. From 25+ year old Wente clone vines, whole-cluster pressed after about 8 hours of skin contact, native fermentation in 50% stainless steel and 50% neutral oak, 11 months in barrel with no lees-stirring. Light straw color, featuring apple and pear fruit, minerals, lees, and a touch of spice. Medium-light bodied with vibrant acidity and a bright, crisp finish, nice. Demuth Kemos 2008 Cabernet Sauvignon, Bei Ranch, Sonoma Coast. From a cool-climate site at 1,600-foot elevation to the west of Cazadero. Dark color, with herbs, cassis, blueberry, and spice aromas. Rich but well-structured, this was lively on the palate with a grippy but long and flavorful finish, very nice. Comments: This was my first experience with Demuth Kemos, and these were both impressive wines (although the Cab was not from Mendocino County so I did not include it in my Favorites list). The Demuth Vineyard is high in the hills above Boonville. Donkey and Goat 2010 Chardonnay, “Untended,” Anderson Valley. From ungrafted Wente clone vines, made entirely in neutral oak. Very light yellow color, this featured bright lemon fruit, herbs, a touch of lees and a slight mineral note. Lively texture and a long, crisp finish, nice. Donkey and Goat 2009 Pinot Noir, Broken Leg Vineyard, Anderson Valley. From 115, 667, and Rochioli clones, 35% whole-cluster fermentation, aged in 50% one-year old oak and 50% neutral barrels. Medium-light ruby color, showing cherry and plum fruit, plus smoky and savory elements. On the palate, a bright, minerally component came out, and the wine finished with moderate tannins, nice. Donkey and Goat 2009 Syrah, “The Recluse,” Broken Leg Vineyard, Anderson Valley. 97% Durrell and Estrella clone Syrah (35% whole cluster), 3% co-fermented Viognier, aged in 1-3 year old barrels. Medium color, with subtle stemmy, herbal aromas along with dark berry fruit and pepper. Medium weight in the mouth but structured and tannic, with a big, grippy finish. Donkey and Goat 2009 Syrah, Perli Vineyard, Mendocino Ridge. 98.5% 174 and 877 clone Syrah (20% whole cluster), 1.5% Viognier, aged in 1-3 year old barrels. Medium-dark color, displaying blackberry, black pepper, roasted meat, spice, and a faint floral note. Quite lively mouthfeel with the structure for aging, finishing with firm but refined tannins, nice. Comments: Tracey Brandt was behind the table, and this was a strong showing for the Donkey and Goat wines. The winery sources their fruit from a variety of growing areas and the wines are made in Berkeley. Drew 2011 Albariño, Anderson Valley. From 30% Valenti and 70% Wentzel vineyards, 50% malolactic fermentation, made in about 50% each stainless steel and neutral oak. Very light straw color, with apple and citrus, herb, and slightly saline notes on the nose. Zingy acidity on the palate and a crisp finish, this should improve given a few months of bottle age to settle down. Drew 2010 Pinot Noir, “Talfryn & Calder,” Anderson Valley. From 48% Balo, 40% Valenti, and 12% Wiley vineyards, using 667, 777, 828, and Pommard clones, 30% whole-cluster fermentation. Medium color, with dried herb and forest floor scents upfront plus black cherry and raspberry fruit and earth. Medium weight with good acidity, this finished with a moderate tannic bite. Drew 2010 Pinot Noir, “Fog-Eater,” Anderson Valley. From 50% each Balo and Morning Dew vineyards, 30% whole-cluster fermentation. Medium color, with more intense aromas of black cherry, herbs, earth, and a floral note. More body and structure than the previous wine, this should be a good candidate for time in the cellar, nice. Drew 2010 Pinot Noir, Morning Dew Vineyard, Anderson Valley. From a vineyard in the “Deep End” of the valley nearest the coast, planted in 2001 by Burt Williams. Rochioli and DRC selections and 828 clone, 50% whole-cluster fermentation. Medium color, with pretty floral and cherry aromatics, baking spices, minerals, and earth. Medium-full bodied with a vibrant mouthfeel and surprisingly refined tannins on the lingering finish, very nice. 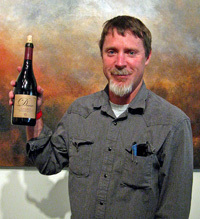 Comments: Jason Drew poured his wines, and both the “Fog-Eater” and Morning Dew Vineyard Pinots were standouts. The Drews have planted their own vineyard with Pinot Noir – they’re located only about three miles from the ocean in the Mendocino Ridge AVA. Edmeades 2009 Zinfandel, Mendocino County. Medium color, this showed red berry fruit, lots of spice, and vanilla/oak undertones. Medium-full bodied, with a relatively smooth mouthfeel and finish, a tasty basic Zin. Edmeades 2006 Zinfandel, Piffero Vineyard, Redwood Valley. Medium-dark color, featuring riper and somewhat high-toned red and black fruits, with touches of earth and oak. Moderately rich, with a more tannic and slightly tangy finish. Edmeades 2007 Zinfandel, Zeni Vineyard, Mendocino Ridge. Medium-dark color, with ripe and brambly raspberry fruit, pepper, and earth, plus a dash of sweet oak. Big and mouthfilling but with good balancing acidity, this had a long finish with chewier tannins – a big but “serious” Zin and quite nice. 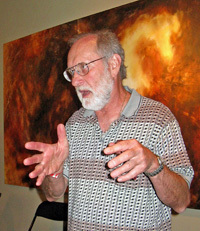 Comments: Dr. Donald Edmeades planted the first post-Prohibition commercial vineyard in Anderson Valley in 1963. Long-known for its Zinfandels, the winery has been owned by Jackson Family Wines since 1988. Mary Elke 2011 Pinot Gris, Donnelly Creek Vineyard, Anderson Valley. Made in 67% stainless steel and 33% neutral oak. Very light straw color, with bright stone fruit, herb, and lees aromas. Medium-light weight on the palate, with a vibrant texture and clean, crisp finish, nice. Mary Elke 2010 Pinot Noir, “Boonville Barter,” Anderson Valley. Medium light color, this showed strawberry, smoke, earth, and dried herb notes on the nose. Medium-light bodied, with milder tannins – fairly straightforward but pleasant. Mary Elke 2010 Pinot Noir, Anderson Valley. Medium color, this was more fruit-forward than the “Boonville Barter,” with bright and intense cherry along with touches of smoky oak and spice. Bigger mouthfeel, with lively acidity and medium tannins on the finish. Elke 2009 Pinot Noir, Donnelly Creek Vineyard, Anderson Valley. Picked at lower brix than the fruit for the Mary Elke label Pinots. Medium-light color, this displayed more earthy and herbal aromas along with bright red fruits and hints of minerals and oak. More textured on the palate, with a bigger structure and somewhat grippier tannins that indicate some cellar time will be beneficial. Very nice Pinot. Mary Elke NV Brut, “Methode Traditionale,” Mendocino County. 60% Chardonnay, 40% Pinot Noir. Light color, with bright peach notes along with yeast, smoke, and herb elements. Medium-light weight and tasty. 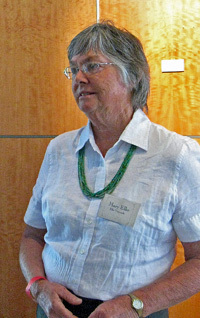 Comments: Mary Elke was on hand to pour her wines. 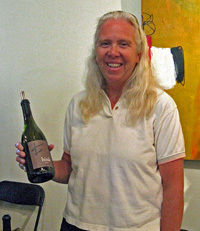 She explained that the Mary Elke label Pinots are intended to be in a more “New World” style, while the Elke label Pinots (with the blue diamond) are more “Old World.” Much of her fruit is sourced from the estate Donnelly Creek Vineyard just west of Boonville. Esterlina 2010 Dry Riesling, Cole Ranch. Light color, displaying ripe stone fruit along with petrol and herb undertones. Medium-bodied, this had a smooth texture but with good acidity, and a long finish, nice. Esterlina 2010 Riesling, Cole Ranch. Off-dry. Similar to the Dry Riesling but with a bit less petrol character, more weight on the palate, and a slightly sweet finish. Esterlina 2008 Pinot Noir, “Reserve,” Cole Ranch. Medium-light color, this had red fruits, earth, and dried herb notes on the nose. Lighter-bodied, it finished with a touch of smoke along with medium tannins. Esterlina 2010 Pinot Noir, Esterlina Estate Vineyard, Anderson Valley. Medium-light color, with bright cherry, earth, and forest floor aromas. Medium weight in the mouth with a lively texture, moderate tannins, and a slightly tangy finish. Comments: Esterlina’s estate Cole Ranch vineyard is located in the Cole Ranch AVA – only 189 acres, this is the smallest AVA in the United States. At around 1,400-foot elevation, it’s in the mountains between Ukiah and Boonville. Foursight 2011 Vin Gris of Pinot Noir, Charles Vineyard, Anderson Valley. Left on the skins for a couple of hours, then made entirely in stainless steel. Very light salmon-orange color, with shy aromas of stone fruit and spice. Medium-bodied with a vibrant mouthfeel and a touch of tannin on the finish. Foursight 2010 Semillon, Charles Vineyard, Anderson Valley. Fermented with native yeast, about 25% new oak. Light color, with pear and stone fruit on the nose. The texture was moderately creamy and viscous, with good acidity and a long finish. Foursight 2009 Pinot Noir, “Zero New Oak,” Charles Vineyard, Anderson Valley. From 114, 115, 777, and Pommard clones, about 30% whole-cluster, fermented with native yeast, all second-year and older barrels. Medium-light garnet color, this had bright, fresh cherry and strawberry fruit, earth, spice, and a hint of flowers. Medium-bodied, with a lively mouthfeel and good structure, and finishing with refined tannins, very nice. Foursight 2009 Pinot Noir, Charles Vineyard, Anderson Valley. Same clones as the previous wine, about 30% whole-cluster fermentation, aged in about 15% new oak. Medium color, showing red fruits, spice, and a touch of sweet oak. Bigger texture on the palate, with more grip on the finish. Comments: This was my first experience with Foursight, and the wines were very good. 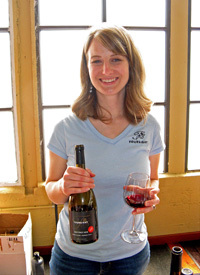 Kristy Charles poured her family’s wines, which are sourced from their 15-acre vineyard near Boonville. Saint Gregory 2010 Pinot Blanc, Mendocino County. Light color, ripe apple and pear aromas. Medium-light bodied with bright acidity in the mouth and a lively finish. Enotria 2010 Cortese, Mendocino County. Light color, displaying stone fruit and spice on the nose. Medium weight and fairly rich on the palate, with a smooth, viscous finish. Graziano 2010 Chenin Blanc, Mendocino County. Slightly darker straw color, this showed citrus and slightly herbal notes. Medium-full bodied with a vibrant mouthfeel and bright acidity on the finish. Monte Volpe 2009 Sangiovese, Mendocino County. 93% Sangiovese, 7% Negroamaro. Medium-light color, this had bright cherry fruit along with spice and a touch of sweet oak. Bright and lively on the palate and not too tannic, with a lingering finish, nice. Enotria 2009 Dolcetto, Mendocino County. Medium color, black cherry and plum with more earth and pepper notes on the nose. More body than the Sangiovese, with bigger tannins on the finish. Graziano 2009 Zinfandel, Mendocino County. Medium color, featuring brambly wild berry, spice, and undertones of vanilla/oak. Bigger and more structured, this finished with moderately grippy tannins. Comments: Greg Graziano’s line-up of wines includes the Enotria, Monte Volpe, Saint Gregory, and Graziano labels. The white wines all have no malolactic fermentation and see no new oak. Handley 2003 Brut, Estate, Anderson Valley. 65% Pinot Noir, 35% Chardonnay. Very light pink color, featuring yeasty aromas up front leading to peach, cherry, and nutty scents in support. Medium weight, bright and lively with a long, tasty finish. Handley 2010 Chardonnay, Estate, Anderson Valley. Light color, this showed slightly herbal lemon and spice notes on the nose. Medium-light bodied with good acidity and a crisp finish. Handley 2010 Pinot Gris, Anderson Valley. Very light color, with stone fruit and dried herbs, plus a touch of citrus. Medium-light bodied, this had a lively mouthfeel and finish. Handley 2011 Gewürztraminer, Anderson Valley. Very light color, with bright floral, lychee, and spice aromas. Clean and vibrant on the palate with a long, pleasant finish – classic Anderson Valley Gewürz, very nice. Handley 2009 Pinot Noir, Anderson Valley. Sourced from both estate and purchased fruit. Light color, displaying bright red cherry, earth, and vanilla/oak on the nose. Lighter-bodied and fairly lively, with mild tannins on the finish. Handley 2009 Pinot Noir, Mendocino. Light color, this featured more intense black cherry and raspberry fruit, along with spice and sweet oak. Medium weight in the mouth, this finished with more noticeable tannins. Comments: Founded in 1982 by winemaker Milla Handley, the estate vineyard near Navarro has been certified organic since 2005. Pinot Noir, Chardonnay, and Gewürztraminer are planted there. Harmonique 2007 Chardonnay, “Un-Oaked,” Anderson Valley. Sourced from 24-year old vines at Conzelman Vineyard. Light color, with aromas of lemon and apple pie. Medium-bodied with a lively texture, this had a fairly smooth finish. Harmonique 2009 Chardonnay, “Un-Oaked,” Anderson Valley. Light color, displaying a more minerally character along with pear, stone fruit, and fresh herb notes. On the palate, this was brighter with more acidity than the 2007, and the finish had more crispness. Harmonique 2006 Pinot Noir, “Delicacé,” Anderson Valley. Mostly Pommard clone from Wiley Vineyard plus a little fruit from Cerise Vineyard. Medium-light color, with cherry, spice, and touches of cola, dried herbs, and vanilla/oak. Medium weight in the mouth, with milder tannins. Harmonique 2006 Pinot Noir, Oppenlander Vineyard, Mendocino County. Medium-light color, less upfront fruit but more floral and herbal aromas plus black cherry, earth, and baking spices. More structured on the palate, with moderately firm tannins that should soften with more bottle age, nice. Harmonique 2007 Pinot Noir, “Delicacé,” Anderson Valley. Medium-light color, this showed a more earthy character than 2006, along with red berry fruit, tea leaf, and sweet oak. Medium-full bodied, with grippier a tannic finish. Harmonique 2007 Pinot Noir, “The Noble One,” Anderson Valley. Pommard, 115, 667, and 777 clones from the estate Klindt Vineyard. Medium color, featuring a more intense, fruit-forward nose of black cherry and plum, along with lots of spice and notes of black pepper, dried herbs, and a touch of oak. Fairly rich mouthfeel, with medium tannins, nice. Comments: A partnership between Bruce Conzelman and Claudia Springs’ Bob Klindt, Harmonique specializes in Chardonnay and Pinot Noir. “The Noble One” Pinot from the estate Klindt vineyard was very good, as was the Pinot from Oppenlander Vineyard, located about ten miles north of Anderson Valley near the town of Comptche. Husch 2011 Sauvignon Blanc, Mendocino County. Very light color, with lightly herbal stone fruit and grapefruit aromas. Medium-light bodied with moderate acidity and a fairly smooth finish. Husch 2010 Gewürztraminer, Anderson Valley. Very light straw color, this featured floral and nectarine notes on the nose. Brighter acidity in the mouth than the Sauvignon Blanc, with a lively finish. Husch 2009 Pinot Noir, Anderson Valley. Medium-light color, aromatic cherry, spice, and vanilla/oak. Lighter weight on the palate with good acidity and a clean finish. Husch 2009 Cabernet Sauvignon, Mendocino County. Medium color, showing plum and black cherry fruit plus sweet oak. A lighter style, this finished with moderate tannins. Comments: Located between Philo and Navarro, Husch is the oldest winery in Anderson Valley – it was established in 1971. Lazy Creek 2011 Rosé of Pinot Noir, Mendocino Ridge. Very light pink color, displaying fresh red cherry, strawberry, and herb scents. Lighter-bodied and bright on the palate, it had a crisp and tasty finish, nice. Lazy Creek 2009 Gewürztraminer, Estate, Anderson Valley. Very light straw color, with shy aromas of lychee and a bit of spice. Light weight in the mouth with good acidity – this seemed as if it had more to show and perhaps more bottle age will be of benefit. Lazy Creek 2009 Riesling, Anderson Valley. Light color, this had a very intense petrol character along with some stone fruit notes in support. Medium-bodied and fairly viscous, with a lively finish. Lazy Creek 2009 Pinot Noir, Estate, Anderson Valley. Light garnet color, bright red fruits, earth, and touches of vanilla/oak and pepper on the nose. Lighter-bodied, with good acidity and a lingering finish. 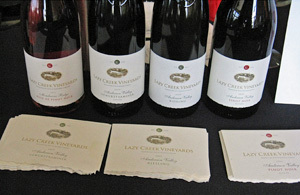 Comments: Dating back to 1973, Lazy Creek is one of Anderson Valley’s oldest wineries. Don and Rhonda Carano (of Ferrari-Carano in Dry Creek Valley) purchased Lazy Creek in 2008. Londer 2009 Dry Gewürztraminer, Anderson Valley. Very light color, featuring lightly floral pear, lychee, and herb aromas. Lighter-bodied and lively, some spice notes were more evident in the mouth, while the finish was long and flavorful, without the bitterness that sometimes marks dry versions of this variety, nice. Londer 2010 Chardonnay, Ferrington Vineyard, Anderson Valley. About 50% malolactic fermentation, made in about 20% new oak and 80% neutral barrels. Light color, this showed apple, spice, lees, and a touch of toasty oak on the nose. With a creamy texture along and good acidity, this had a clean and tasty finish, nice. 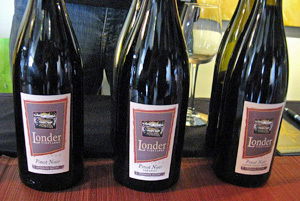 Londer 2009 Pinot Noir, Anderson Valley. Sourced from Londer, Ferrington, Corby, and Valley Foothill vineyards, 30% new oak. Medium-light ruby color, with milder aromas of red fruit and spice, plus hints of orangepeel and vanilla/oak. Medium-light weight on the palate, this had a lively texture and moderate tannins. Londer 2009 Pinot Noir, “Paraboll,” Anderson Valley. Sourced from Ferrington and Valley Foothill vineyards, 40% new oak. Medium color, this displayed deeper fruit than the previous wine, along with notes of earth, minerals, tea leaf, and smoky oak. Bolder mouthfeel and structure, a promising wine that deserves some cellar age to show its best. Londer 2007 Pinot Noir, Estate, Anderson Valley. 30% new oak. Medium color, more intense ripe black cherry and spice on the nose, along with notes of earth, dried herbs, and sweet oak. Greater richness in the mouth, with a bit more tannic grip on the long finish. Comments: Larry & Shirlee Londer’s 16-acre estate vineyard near Philo is planted to Pinot Noir and Gewürztraminer. This was a strong showing for their wines – all five of them were very good. Skylark 2011 Pinot Blanc, Orsi Vineyard, Mendocino County. Made in about 60% stainless steel and 40% older oak. Light straw color, with leesy pear and apple scents, along with a touch of fresh herbs. Medium-bodied and creamy on the palate, with good acidity and a clean finish. Skylark 2011 “Pink Belly,” Mendocino County. Grenache Rosé, made using the saignée method. Light pink/salmon color, with fresh watermelon, strawberry, and spice notes. Lighter-bodied with a fairly smooth mouthfeel, this had a slight tannic bite on the finish. 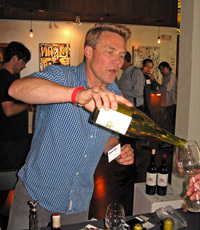 Comments: I had tasted several very nice Skylark wines at the recent Rhone Rangers event in San Francisco so I only tried a couple at this event that I had not tasted earlier.